This beautiful site has an excellent viewing tower which overlooks marsh, mudflats and the waters of the Gulf of Mexico. 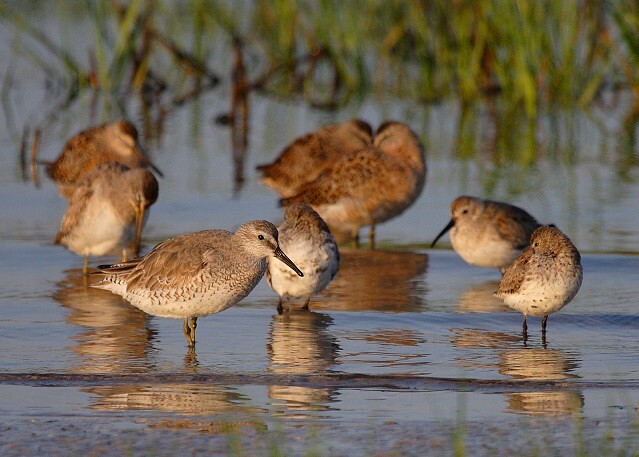 During the winter, spring, and fall, large flocks of shorebirds and wading birds can be observed; a spotting scope will provide great views. Plan to arrive on an incoming tide to enjoy Marbled Godwit, Greater Yellowlegs, Short-billed Dowitcher, Semipalmated Plover, Least Sandpiper, Dunlin and Western Sandpiper. In late summer and fall, Reddish Egrets are common, and in winter, ducks such as Bufflehead and Lesser Scaup can be found. Bald Eagles nest here and are regularly observed between October and April; look for Northern Harriers quartering the salt marsh in winter. Look and listen for Clapper Rails, Marsh Wrens and Seaside Sparrows in the salt marsh; Nelson’s Sparrows and Sedge Wrens may also be present in winter. Picturesque pine flatwoods lining the entrance drive shelter resident Wild Turkey, Brown-headed Nuthatch and Eastern Towhee. Picnic facilities and a restroom (vault toilet) are available near the viewing tower. Seasonal hunting does take place in the area, please click here for details.